The first 5 minutes of my pitch for the "Best of Tools and Infrastructure Application" session didn't went on smoothly - the projector decided not to collaborate with me, by flickering its eye every 10 seconds or so. But, the stopwatch was running, and I had only 20 minutes to convince the panel of judges. Luckily, Julian was there to "negotiate" with the VGA cable. 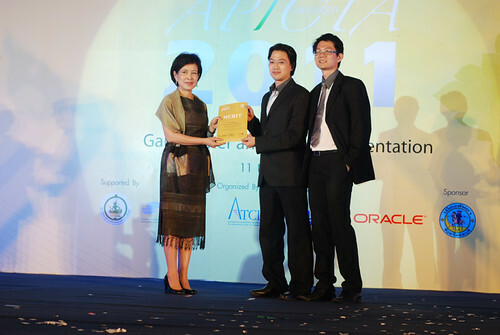 I was told that the "Best of Tools and Infrastructure Application" category is always a tough fight at APICTA Awards, as the nominees are usually the reputable infra software companies with more than 10 years of strong history and presence in the enterprise architecture market. But, we took this to our advantage instead, by telling the judges that, Open Dynamics is a 2-year young open source product company, with 1,000 adopter sites and 22 partners spanning across the globe. 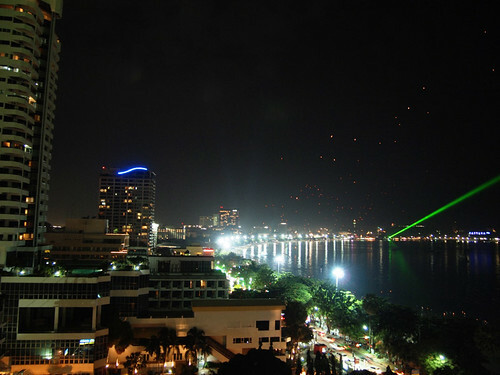 The 11th APICTA Awards 2011, held on 11.11.11; and coincidently, it was also the day that Thais celebrate the Loi Krathong Festival! An auspicious day indeed. The "starry" sky that you see in this photo, were the Sky Lanterns. There's a secret that no one knows about it yet, before this post is published. I actually pre-composed this tweet in my phone, and pressed the "Send" button immediately when Joget Workflow was announced as one of the winners :p Jack was in Taipei during that time, and anxiously waiting for my update on the awards ceremony night. Luckily I didn't need to trash this tweet message from Draft haha. Thanks to all Joget Workflow community members, adopters and implementation partners. Without your trust on us, we will not be recognized at the international stage today.